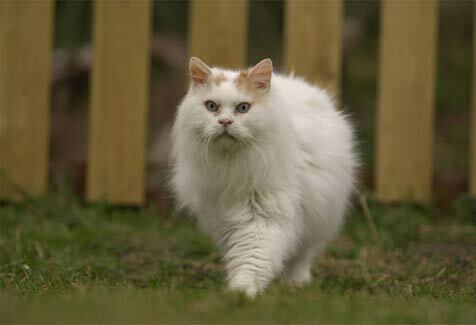 Turkish Van Cat breed information and advice. Not only does the beautiful Turkish Van breed love humans, they love the water! Turkish Vans are well known for having a love of water, so don’t be surprised if you find you’ve got a helper when it comes to doing the washing up, or your cat tries to join you in the bath or shower! With this in mind, it’s always worth keeping the toilet seat down, and the bathroom door closed! Turkish Vans also quite like heights, and will try to find the highest point in the room — often the top of bookcases and cupboards — to climb up and peer down at you! Owners and breeders alike describe this fluffy breed as loyal, loving, and very intelligent. They are often described as being dog-like in their behaviour, as they will follow you from room to room, enjoy playing games of fetch, and love their humans. Most get on very well with other cats, and even dogs. Turkish Vans are mainly auburn and white in colour, with auburn ‘butterfly’ markings on their heads, and rings on their tails. The trademark ‘thumbprints’ of colour will occur on their back predominantly. Other colours include white with black markings, white with blue markings, and various tortie or tabby combinations. They have full, bushy tails and their eyes are either amber, blue, or sometimes different coloured. Turkish Vans get on with most other cats, and would suit a family home with older children. They love company and wouldn’t enjoy being at home alone all day, so if you work full-time, it’s always best to have a companion for them so they don’t become lonely and bored. It is believed that Turkish Vans were aboard Noah’s Ark, and it is said that the Allah blessed each animal as they left the ark and made their way back down Mount Ararat. Apparently, he accidentally touched the cats on the shoulder, leaving a mark known as the ‘thumbprint of Allah’. Turkish Vans are believed to have originated from the Lake Van region of Turkey, and were kept as pets for centuries. They were brought to the UK when Laura Lushington and Sonia Halliday, who were working for the Turkish Tourist Board, were offered two kittens— a male and a female — by their hosts. During their visit, they watched as both kittens started swimming in a local stream where they had camped, and they brought the kittens back home to England with them. When the women visited Turkey again, they brought back two more Turkish Vans to continue breeding, and worked hard to have the breed recognised by the Governing Council of the Cat Fancy (GCCF), which they achieved in 1969. Their semi-longhaired, water-resistant coats don’t mat easily as they have no undercoat and also tend to repel dirt, but a weekly brush is still a good idea to remove loose hairs. As they tend to enjoy water, an occasional bath is not essential, but may be enjoyable for your cat! Turkish Vans are not predisposed to any health conditions and breeders say that they are generally healthy, robust cats. One of the most famous Turkish Van lovers is composer Lord Andrew Lloyd Webber, who has been known to take a swim with his Van, called Fez! The Turkish Vankedisi has the same characteristics and temperament as the Van, but has pure-white, semi-longhaired fur, and is more predisposed to having different coloured eyes.